Self inspection mirror with adjustable lights. 3 LED lights illuminate darkened areas for perfect inspection. The Square Telescopic Inspection Mirror with LED Lights features adjustable lights and an extendable handle. 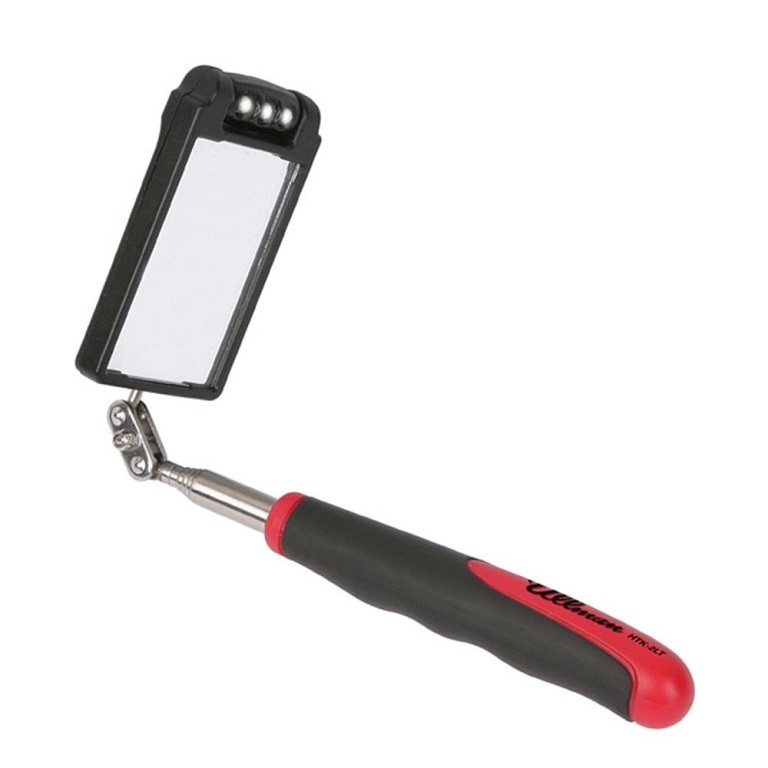 This hand held mirror allows the user the perform accurate inspection of their feet or other hard to reach body parts. Three adjustable LED lights provide better lighting for more targeted illumination of the area being inspected. The stainless steel handle extends from 6 1/2 to 29 1/2 inches long for positioning the lighted mirror. People with limited hand strength will find the cushion handle is easy to grip and will not slip in wet or oily hands. The ball joint holds the lighted mirror head firmly at any angle for perfect viewing. Mirror Dimensions:2 1/4 inches wide, 3 1/2 inches long. Telescopes: 6 1/2 to 29 1/2 inches. Power: 2 CR2016 coin cell batteries included. Item weighs: 4 lbs. 8 oz. When I tried to remove the sticky in the battery compartment, the cover popped off and the batteries flew out. I never did find one of them and had to go buy one. I would prefer the mirror were 3 times the size with 3 X as many lights but it will work for what I need.